911uk.com - Porsche Forum : View topic - Retrofit reversing camera ? 911uk.com Forum Index > 991 (2011 - current) > Retrofit reversing camera ? Posted: Thu Feb 07, 2019 12:03 am Post subject: Retrofit reversing camera ? I’ve seen a few cars that have a reversing camera opposed to the beeps and colour guidance is this something that can be retrofitted ? If it is a factory option, it can definitely be retrofitted. ( I don't have a 991, do not sure whether it is an option.) I got one fitted for my golf R.
Very useful tool to have especially at night. There was a very recent thread here about retrofitting a camera. 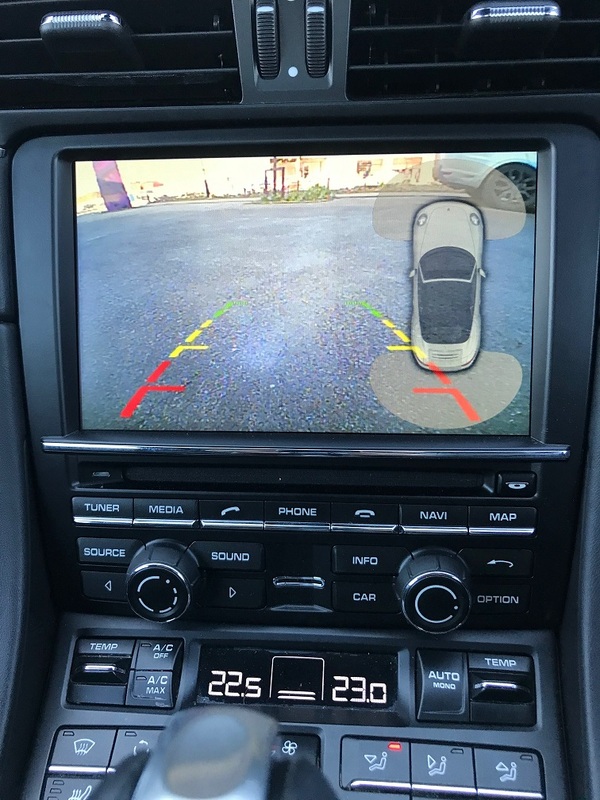 I had a reverse camera on my old car and have decided to get one fitted for my 991, fitting is due to take place on Monday so i will update you when complete, it is being done by a local car electronics co who specialize in retrofits, cost unfortunately is £500, but i just cannot see out of the back of my car so cheaper than a prang! Perfect VIB12 I wait to hear how it goes. Ye I can’t see either but just go by the beeps n colours. I’ve noticed when red there’s still a good bit to go before a clash so confident using it but a camera would be better. Also noticed in this cold spell we have been having that it even goes off at traffic lights and the odd passing car. Thanks Slayer I’ll have a look for the thread. I do remember you being on the 997 page when my car was having the rebuild at hartech back in 2010. So how did the camera fitting go ? Anypics ? So install was completed on Monday about 2.5hours, works very well and interfaces with the PCM, the chap did say that the car thinks this is an original part so now the parking sensor image of the car is reduced in size and located on the right hand side of the screen with the camera image behind it. No pictures i am afraid as of yet as the car is in having some warranty work undertaken but should be back by weekend so i will get some images then. in my opinion well worth the £500. Thanks VIB once my PPF is done that will be my next job. Keen to see some pics once you get your car back. Anyone use these people? The good thing is they fit on site. Pictures as promised, works very well and all parking sensors still show on the screen. Looks good I’ll need to get on to that soon, thanks for the pic. Posted this in other thread some time ago... But for those interested yes, you CAN retrofit a rear / reversing camera to your 991... even if your car does not have Park Distance Control feature. In 2 parts I provide detailed instructions, with pictures, of a custom install on my 2014 991 C4S. I don't use OEM parts, and the dealers won't do the install because they don't have "official" retrofit Work Manuals from factory to do so. The solution I installed integrates perfectly with the 991 PCM 3.1 unit, WITHOUT opening or modifying the kit. Thanks for the reply but what effect would that have on my Porsche warranty ? I’m guessing they wouldn’t approve a third party retrofit ? No effect whatsoever. The interface that I used in that DIY is purely an external connection. No need to crack-open the PCM case. If you follow the detailed steps I provided you'll find that you aren't tapping-into anything that would be anything different than you adding a radar detector, or dash-cam to your 911.